The gardens made on the fringes of Central Asia in the past 5000 years form a great arc. From the Fertile Crescent, it runs west to Europe and east to China and Japan. Asia's fringe was a zone of interchange: a vast landscape in which herders encountered farmers and the design of symbolic gardens began. It appears that as they became settlers, nomads retained a love of mobility, hunting and the wild places in which their ancestors had roamed. Central Asian and Indian ideas influenced the garden culture of China, Japan and South East Asia. In West Asia, Aryan settlers made hunting parks known as paradises. They were walled enclosures stocked with exotic plants and animals. In East Asia, great landscape parks were used for similar purposes and had a sacred role. Across Asia, gardens were influenced by religious and other beliefs: polytheist, Hindu, Buddhist, Muslim, Daoist, Shinto and Modernist. Early parks and gardens symbolized wild and civilized nature, sometimes conceived as the realms of the Sky God and the Earth Mother. Asian Gardens: History, Beliefs and Design explores the ways in which designs were guided by beliefs. Tom Turner has been researching and teaching the theory and history of garden design for some forty years. His visits, research, drawings and photographs are brought together in detailed studies of West Asia, South Asia and East Asia. The period covered extends from the earliest gardens to the present. Using maps, diagrams and photographs, the author explores how and why Asian gardens developed their characteristic forms and functions. Treating garden design as a 'word and image' subject, the account is coherent, comparative and readable. Further details of all the gardens are available on the gardenvisit.com website, which the author edits. 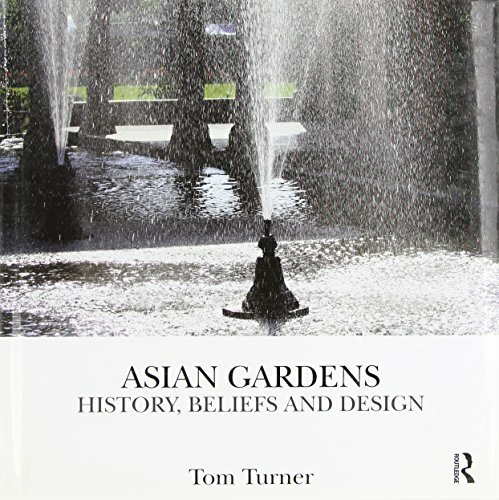 Tom Turner teaches on the undergraduate and masters programmes in garden history and landscape architecture at the University of Greenwich in London.